Update: This story has been updated with a response from Tim Height, owner of Tiger Paw Exotics and provider of the animals for this event. 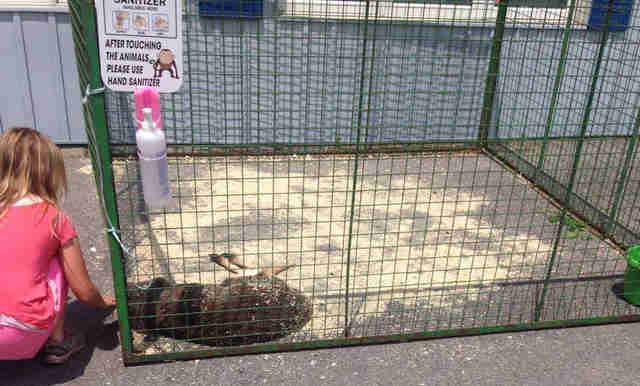 When Jonathan Cole took his little sister to an Ontario street festival over the weekend, the first thing to catch the 10-year-old's eye was the petting zoo. A big animal lover, she rushed ahead to see the kangaroo exhibit. Instead, she found a nightmare. The searing sun bore down on the kangaroo without a hint of shade. 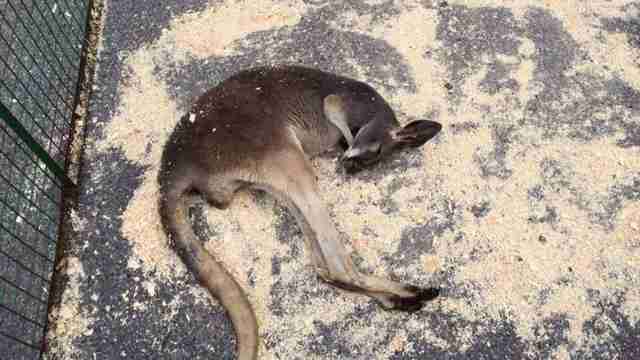 "The kangaroo was laying on the ground, obviously in distress unable to move," Cole told The Dodo. It was all part of the menagerie of misery that greeted visitors to the Aurora Chamber Street Festival on Sunday. "There were probably six or seven cages pulled together with a tent over all of them. But the tent was way too small to cover all the cages," Cole said. 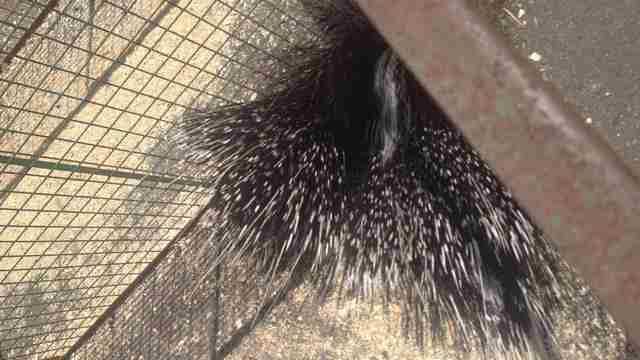 "There were two porcupines fighting each other for the one corner of shade they had." 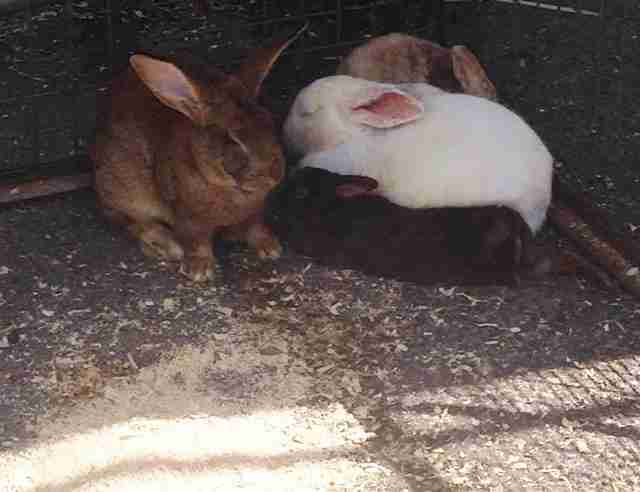 "There were rabbits bunched together trying to get into the shade," he added. Cole said he immediately confronted Tim Height, whose petting zoo business, Tiger Paw Exotics, provided the animals for the festival. "He outwardly admitted it, saying 'Yeah, they should probably all have shade, but we thought it was going to rain, so we didn't put out any shade,'" Cole alleged. "He noticed we were very upset about this and it turned into a joke for him." At that point, Cole's little sister was devastated, hunched over the cage trying to comfort the ailing kangaroo. "We had to leave because she was bawling her eyes out," he said. But on the way out, Cole called the Ontario Society for the Prevention of Cruelty to Animals (OSPCA) to alert the organization about the exhibit. "An hour later, they called us back and said they had just left there and made him change the setup to make sure all the animals were completely covered," he said. Cole didn't stop there, and got in touch with members of Aurora city council, the mayor and even PETA. "I just wanted to make sure the word got out to everyone about this guy," he noted. It turns out, Cole wasn't the only visitor horrified by what he saw at the festival. Organizers of the Aurora Chamber Street Festival have been getting complaints about the exhibit since Sunday. "We are very grateful that this has been brought to our attention," Crystal Walsh of the Aurora Chamber of Commerce told The Dodo. Walsh says organizers "are not going to hire this company in the future or have an event of that nature." Tiger Paw Exotics, a traveling zoo that bills itself as "family-oriented" on its website, responded by email several days after the story was published. In a statement, zoo owner Tim Height called reports about the condition of the animals "false and outright lies." Height noted when his staff was setting up the zoo, "the weather was overcast and cool." "At the time when the photo of the kangaroo was taken the sun had just broken through." In addition, he explained, "kangaroos in their native land relax and sleep during the day and are active in the morning and evening." But it isn't the first time Height's company has been the subject of complaints about its animals. Tiger Paw Exotics came under fire in March for its treatment of a camel at another event, which seemed to be ailing in a small enclosure. "A camel doesn't move around a lot, they like to lie down," Height told City News at the time. "To us it's not an issue, but if we find out the public has an issue, we don't mind changing it." Organizers of the Aurora street festival, however, are taking more decisive action. "We want everyone to know that we appreciate the concern around this," Walsh said. "We're concerned as well. We're taking action to ensure it doesn't happen again."